Marvel loves a good “war” event (Secret war, Civil war, World War Hulk, etc), and as far as naming goes, War of Kings is right up there at the top. A cosmic war of kings? Involving the Kree and Shi’ar empires? Ok, hang on, let me clear my schedule. One major change in War of Kings is that it really starts to blend the earth-bound Marvel Universe with the Marvel Cosmic scene. 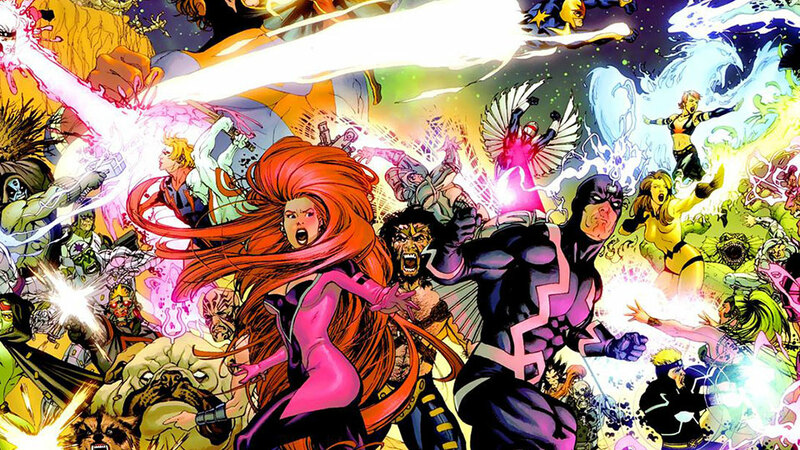 Don’t worry, our heroes never even set foot on Earth (aside from Nova), but War of Kings brings more familiar faces to the Cosmic battlefront, including the Inhumans and X-Men. The end result is something of a mixed bag, and for reading purposes it also results in more “issue-by-issue” reading needs. Whereas Annihilation and Conquest were relatively self-contained, War of Kings feels comparatively sprawling. This creates the need for both a trade collection list and an issue-by-issue reading list, because every issue of Guardians and Nova might follow a specific issue of the main War of Kings series. You can find all that and some background reading suggestions below. As always, you can send your questions to me here. The adventures of Richard Rider continue for several issues in between Annihilation: Conquest and War of Kings. Nova’s War of Kings involvement is pretty peripheral, but for those of you enjoying Richie’s story, there are a lot of big developments in these issues. Even though this trade is labeled “War of Kings” it really fits in better as a prologue. While it may seem a little odd including a Secret Invasion tie-in here, the impact on the Inhumans sets the stage for much of War of Kings. If you want to dive right in, the Road to War of Kings includes some slight Inhumans’ backstory as well. The former two trades will help explain Emperor Vulcan, while the latter two trades will help explain the state of the Inhumans. Not required reading, but a good bit of “what the heck’s going on here?” history. Note: From this point forward, you’ll need more of an issue-by-issue guide to keep continuity in tact. The relevant trades for these issues are included below. where do the skaar and warrior stories land in this reading order? mu has not done a great job of “curating” this pretty wide-spreading story. War of Kings – Warriors #1 contains Gladiator and Blastaar stories. These were originally released as Digital Exclusives with two issues each before appearing as a combined TPB (minus 3 covers). In the same way, War of Kings – Warriors #2 included Crystal and Lilandra stories (with the TPB missing the 3 covers again). Hey just getting ready to start war of kings, however I’ve found a war of kings: warriors blastaar and also Crystal, I’m wondering if I should bother with these? i think you are right here! was reading this and suddenly went: why the hell is he making me stop here? then saw the secon nova#22 and realised you were correct! I just want to give you a super really extra big thank you for putting this guide together. Using your guides, I’ve been reading through the Marvel cosmic epic, starting with Annihilation, and it has been some of best comic book reading I’ve done EVER, so thank you! One quick question regarding this read order in particular, though: I’ve seen, on Marvel Unlimited, an X-Men: Emperor Vulcan limited series and a few digital-exclusive War of Kings: Warriors series. Where exactly would those fit into this read order? I’m guessing he/she didn’t include Emperor Vulcan on purpose. It’s probably the worst of the four, as it’s a timeout from the X-Men/Vulcan battle and is largely a distraction. There are still 2 or 3 plot advancements though. Personally, I’d say just read Rise & Fall of the Shi’ar. The other 3 only have a couple of plot advancements and end largely how they begin. “Looks like Vulcan’s blasting off again!” The X-men also fade into the background once you get to the core event so what’s the point in reading the buildup?